The push for lab data interoperability is coming from many directions, and LOINC plays an essential role. At the workshop you’ll learn what’s necessary to implement LOINC into your systems. 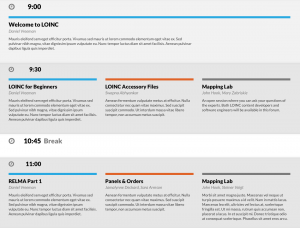 We’ve massively retooled and expanded the LOINC Workshop to include keynotes and all-new sessions led by the LOINC team experts. Choose sessions that match your interests and experience at this in-person, hands-on event. Your workshop fee gives you complete access to all the sessions. Whether you’re just getting started or are an experienced LOINCer you’ll learn how to take your LOINCing to the next level. Wednesday evening features a poster reception highlighting real world applications of LOINC and the opportunity to network with other attendees at the beautiful Regenstrief headquarters. Hear the latest updates and discuss key issues at the Public Laboratory LOINC Committee Meeting on Thursday. As always, the Committee Meeting remains free and open to the public. Your $250 conference fee provides tremendous value. You get admission to your choice of sessions—and access to all the recordings and materials after the event. 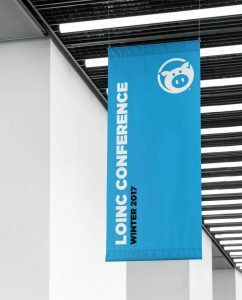 LOINC Premium Members and Sponsors even get a 10% discount on the cost. Every workshop session is led by LOINC’s team of experts. You’ll be face-to-face with the people who build the standard, and they’re eager to help you learn how to use LOINC. Straight from the horse’s (pigs) mouth, so to speak. We’ve organized the sessions with plenty of time to address your specific questions. We’re excited to offer a wide range of hands-on training session, with each one led by the standard-makers themselves. Review the entire schedule and find the track that best fits your needs. During registration, you will select the sessions you plan to attend. 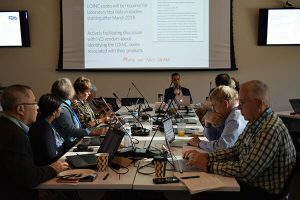 The Laboratory LOINC Committee convenes on the second day of the conference to hear updates on LOINC adoption and discuss key issues for LOINC development and implementation. All are welcome to attend.